The more corners of the world I adventure to, the more hotel pillows I lay my head on, the more my idea of the perfect place to stay changes. Once upon a time, I’d have judged five star luxury on the basis of volume of marble in the lobby, minutes it took for the concierge to source tickets to a sold-out show, and whether I could work any of hi-tech gadgets in the room (a control panel far too complex to fathom? It must be an uber-luxe hotel…). These days my ideal hotel is smaller, more stylish and a lot more personalized. I prefer boutique hotels over megalith chains – but, let’s get started by stating the obvious. Boutique is better. That aside, what elevates a handful of rooms and design magazine-worthy interior to a truly stellar hotel experience? What gives a hotel the X factor? For me it’s a finely tuned combo of great service, great location, great food and the sort of bed that you can only imagine is made of clouds. On my trip to Lombok last December I found a hotel so incredible, that not only is it my very own personal hotel Nirvana but I pretty much defy anyone not to be wowed by it. 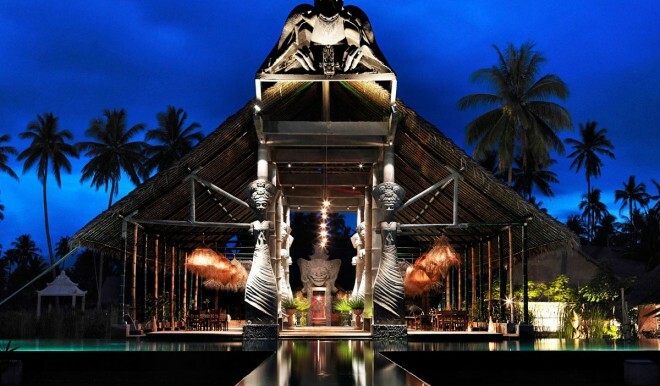 This perfect hotel is Tugu Hotel. Located in Lombok, an hidden, unpolished jewel traditionally overshadowed by the fame of its neighboring island of Bali, this hotel is nothing short of a fantasy paradise that mixes culture and history with recycled art and objets trouvés. With a design engineered with absolute brilliance, the property and accommodation is part collector’s residence and part luxury hideaway, all wrapped in a delicate and time-honored style of yesteryear. Every corner, every detail turn this hotel in one of the most specials I ever been. Emerging from the lush and green jungle this spot it’s impossible to describe without liberal use of tired old clichés because it genuinely is picture postcard stuff. We stayed at Bhagavat Gita Oceanfront Suites… This spacious suite is housed in a beautiful building from the colonial era, with high thatched ceilings, tall antique doors and furnishings, private tropical gardens and private lotus pond. The bathroom is outdoor, rustic-luxe with large rain shower and a stone bathtub. You also have a Private large plunge pool overlooking onto the ocean and beautiful beachfront. But the best thing is the bed… wow, I never slipped in such a huge bed!!! The big mosquito-netted four poster beds ensure an incredible night’s sleep, definitely helped along by the slumber-inducing chorus of cicadas and lullaby of crashing waves. Leave the curtains open at night and you’ll wake to the spine-tinglingly beautiful view of the sun shimmying its way up into the sky above the blue, blue sea. A vision which makes a morning swim irresistible. Luckily a dip lies just a hop, skip and a tumble away from your pillow. As the hotel is remote and there are no restaurants and bars in the vicinity, Meals are served in the open-sided restaurant in the center of the resort with views to the swimming pool and beach. The swimming pool is incredible! Pictures talk by themselves. The gardens and beach are amazing… sand is powder fine and dazzlingly white, the surf is truly mouthwash turquoise… It is utterly deserted. You can spend all day relaxing in the bamboo beds. What goes on Tugu Hotel Lombok? Well, days drift by in a blur of napping, reading and splashing through the surf all punctuated by delicious meals and a few Bintangs. If that sounds like too much hard work, you can get a massage in the spa or just while away the hours reclining on the daybed on your garden counting the myriad shades of blue smudged across the horizon in front of you. Alternatively, if doing nothing’s not your thing (who are you and what is wrong with you??? ), the beyond helpful staff will happily bundle you off on an adventure tailored to you. The sunset was magical, I sited back and watched the sky turn amber while sipping a gin & tonic. Once night falls and you can have dinner in The dramatic long sandy beach lit by the moon, the stars, and the bamboo torches. I had dinner and its was pretty special… turn your face skywards and prepare to be dazzled by a stargazing extravaganza. In all the corners of the world that I’ve made it to so far, Tugu Hotel ranks up there with one of my favorite hotels. If you get the chance to visit, go in a heartbeat! I left the hotel in their private boat heading to my next destination, Gili islands, that is just 30 minutes away. Watch a video I did during my stay at this amazing resort. Here is the video of my journey in Indonesia, during one month I explored the islands of Java, Bali, Lombok e Flores.